As I mentioned on Monday, we invited my Mom over for dinner. Since Tony was paid last week, I finally went "real" grocery shopping! Not just stopping into Aldi to buy some fresh produce to go with whatever was on hand. It felt amazing. 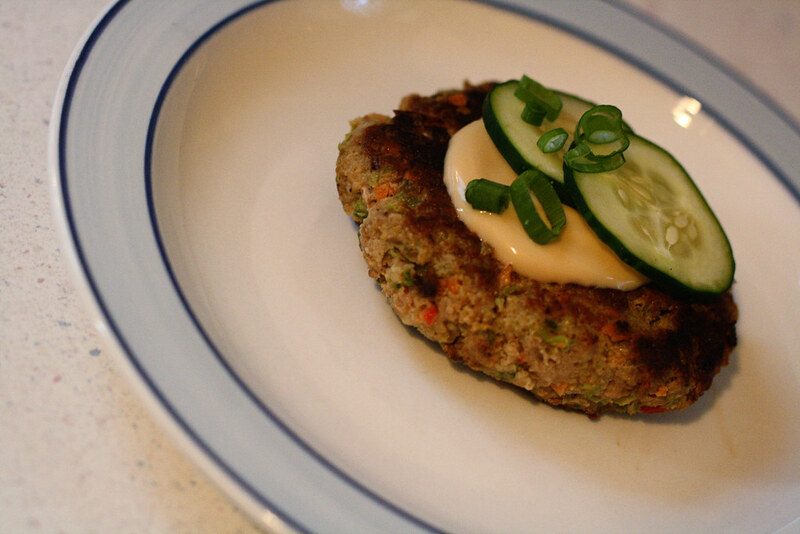 All that to say, I tried out/made up a recipe for Turkey Teriyaki Burgers. Now to be fair, the recipe was based on a Pork Teriyaki Burger recipe from a cook-off cookbook from 2006, but I made some adaptations. Process frozen vegetables in food processor until they are small pieces, refer to picture. Combine chopped vegetables with turkey until mixed well. Add S&P, garlic, ginger and green onions until mixed well. Spray skillet with non-stick spray and on medium heat grill patties for 12 or so minutes, turning once. In the meantime, combine yogurt, mayo and teriyaki sauce with a metal whisk in a small bowl until well blended. Place cooked patty on whole wheat burger bun, add a dollop of sauce and garnish with thin slices of cucumber and green onion. Sounds delicious! And very different from anything I've ever tried...so I may have to give this one a shot sometime soon :) Thanks for sharing! We've been on a ground turkey kick instead of beef around here and these sound right up my alley. I'll be putting these on the menu for the weekend, thanks Leah!